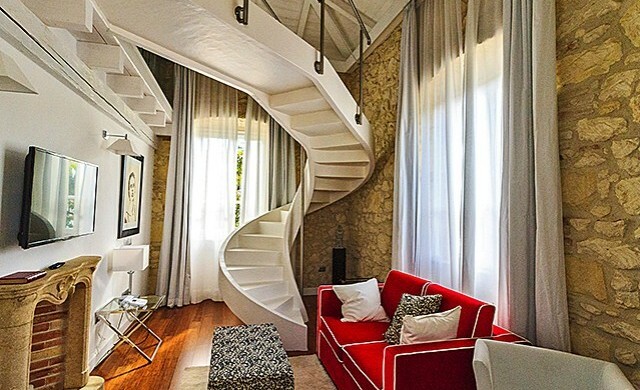 Villa Fanny has 19 guest rooms, each with its own striking detail. In some it is a decorative fireplace, creating a unique atmosphere, in others the bathroom, a real sanctuary of pleasure, or the mansard ceilings and skilfully restored walls. And if you want a truly special experience, there are the suites. These charming split level apartments provide the pleasures of a wellbeing centre in the privacy of your own room. Warm and welcoming. Some rooms have high ceilings with old wooden beams and exposed trusses. Facilities: parquet, soundproofing, complimentary Wi-Fi, Wi-Fi speaker, 32’’ LED TV with satellite channels and SKY, slippers, telephone, safe, climate control, minibar, pillow top memory mattresses, bathroom with walk-in shower, towel warmer, hair dryer. Spacious, airy and elegant. The sophisticated furnishings and attention to detail in these rooms stand out. 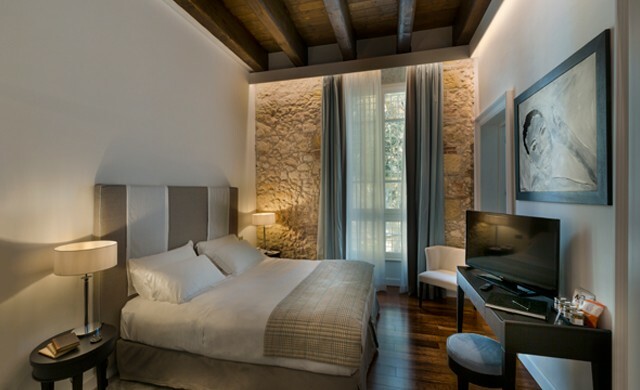 Some rooms also feature details such as mansard ceilings and old, lovingly restored stone walls. Facilities: parquet, soundproofing, complimentary Wi-Fi, Wi-Fi speaker, 40” LED TV with satellite channels and SKY, bathrobe, slippers, telephone, safe, climate control, pillow top memory mattresses, tea and coffee making facilities, minibar, bathroom with walk-in shower, towel warmer, hair dryer. Beautifully appointed with furnishings in warm colours, this split level suite has a lovely view over the garden. 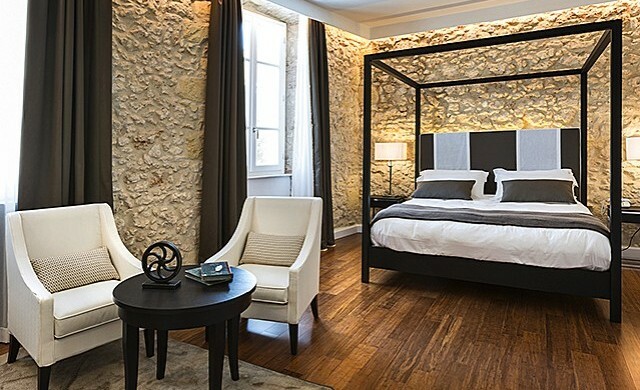 The upper floor features a comfortable double bed, a large bath and a walk-in shower. Facilities: parquet, soundproofing, complimentary Wi-Fi, Wi-Fi speaker, 2 LED TVs (32” and 40”) with satellite channels and SKY, bathrobe, slippers, telephone, safe, climate control, minibar, pillow top memory mattresses, tea and coffee making facilities, bathroom on upper floor with bath and shower, towel warmer, hair dryer. This split level suite has a lovely view of the garden. 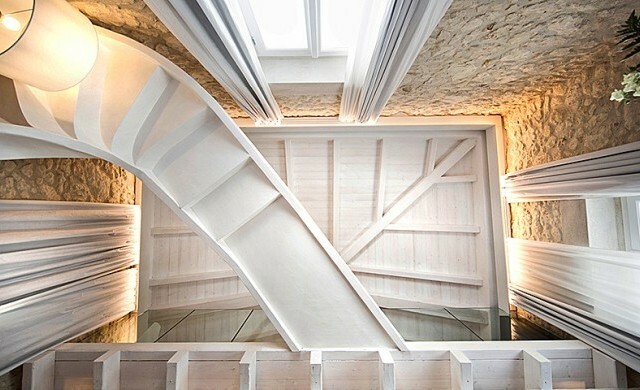 It has a bathroom with a Finnish sauna, an emotional shower, hammam and walk-in wardrobe. The upper floor has a bed and a large bath. Facilities: parquet, soundproofing, complimentary Wi-Fi, Wi-Fi speaker, 2 LED TVs (32” and 40”) with satellite channels and SKY, bathrobe, slippers, telephone, safe, climate control, minibar, pillow top memory mattresses, tea and coffee making facilities, walk-in wardrobe, two bathrooms: on the lower level a Finnish sauna, emotional shower and Turkish bath, on the upper floor a bath, towel warmer, hair dryer. Characterized by a minimal and elegant design The Luxury Garden Room is a small treasure chest. Hidden in the garden of the Villa, the Garden Luxury Room has a whirlpool tub that overlooks its small Zen garden. Facilities: parquet, soundproofing, complimentary Wi-Fi, Wi-Fi speaker, 40” LED TV with satellite channels and SKY, bathrobe, slippers, telephone, safe, climate control, pillow top memory mattresses, tea and coffee making facilities, minibar, bathroom with walk-in shower, hair dryer.